Rio is a majestic and extremely big place. You can get lost literally and metaphorically. 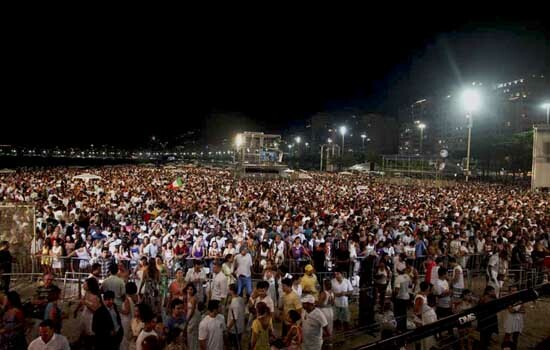 During the popular New Year's Eve in Rio, millions of people from all over the world come in and manage to experience the majesty of the event. Of course there are some people brave enough (or spontaneous enough) to experience the offerings of the New Year's Eve in Rio. Going alone could pose a bit of a problem for some, but it is definitely something that will open you up to a unique Brazilian experience. It is necessary that when you plan to go for this event, you have everything covered. From the hotel accommodations to the trip to the city, it is imperative you get things fixed weeks before the New Year's Eve in Rio. One of the most practical things you can do is to stay with friends or relatives around the area if you are alone. Otherwise, a hotel is your only choice. The multitude of people all over the New Year's Eve in Rio can help you out in looking for establishments, finding yourself in the Copacabana area and other things. The most essential thing about being alone in this place is to trust your instincts and trust people. Brazilians are generally friendly and helpful and sometimes they can become great friends for you to hang out with all through the night and even after the New Year's celebration. If you do not know how to speak the language, it will be much harder for you to adapt to the everyday proceedings of the people in Brazil. Of course there will be English speaking people but the best experience is to understand at least a little bit of their language. Going to a country with a different culture is best experienced by talking to the people. Especially if you are going to the New Year's Eve in Rio. You definitely need to learn some basics of Portuguese to have an edge. 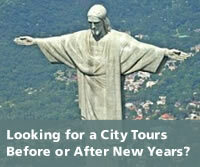 It is essential to look for the best ways to enjoy Brazil while waiting for the New Year's in Rio. You must experience some things that you have never done before. One thing that is great about being alone is that it gives you more opportunities to explore the world. It will open you up to a variety of experiences. Go practice surfing and kayaking in Buzios, shop at the amazing stores in Ipanema or just walk around the amazing streets and absorb the culture in both conventional and unconventional ways. This will prepare you up to meeting up to 2 million people in the New Year's in Copacabana. Expensive hotels could range up to thousand dollars along the coast of Copacabana and Ipanema. You must know the cost of the taxi fares and you must know how prices vary for other services such as food and other basic needs so you can save on some souvenirs for your friends as a proof that you did not lock yourself at your hotel and watched the New Year's’ party there. One of the best ways an individual can feel much more relaxed and filled is by eating the delicious Brazilian food. There are sorts of food choices that will surely surprise you, and of course there are specific ones that are more traditional to the New Year's Eve in Rio. Lentils, pork, fish, as well as grapes are traditional foods for prosperity that are usually served for the New Year supper. Being alone is not a reason to not enjoy. Especially in Rio where things can go really energetic and highly addictive, you must let go but not to the point of being wasted. The New Year's Eve in Rio is a celebration of a new beginning and an experience that is worth trying out. Who knows? If you wear red, your luck might change and next time, you will be going with someone really special for another exciting experience in the New Year's celebration Rio de Janeiro style. Or if you wear yellow next year you may have money enough to stay at the best hotel in town!